Kennebunkport, Maine is the perfect New England small town. With beautiful beaches, delicious eats, shops, and sweeping coastal views, it's one of our top picks for a New England weekend getaway. It's also less than a 2 hour drive from Boston. We made our way up Friday around noon and by 2pm we were enjoying a beautiful day by the ocean. 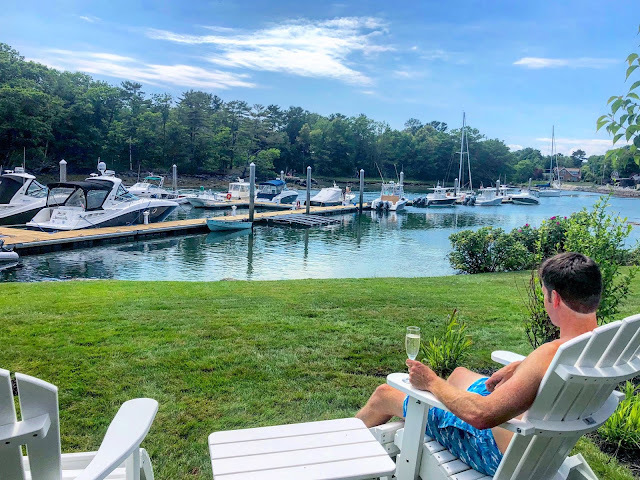 We stayed at the Yachtsman Hotel & Marina Club for the weekend. The bungalow rooms are all situated right on the Kennebunkport river channel that leads to the open ocean. From our room and patio we were able to enjoy great views of the water and boats passing by. All of the rooms are newly remodeled with high ceilings, shiplap walls, and boutique style furnishings and decor. Their main patio is a beautiful spot to enjoy a drink during happy hour or a morning cup of coffee.